Whether you are just getting started or are an experienced adjuster, success in the following areas will ensure that you have a strong and rewarding career as a claims adjuster. Customers want the best service available and that holds true when they are working with a claims adjuster. Be an expert with the information that your specialty requires and be familiar with the necessary language usage. Stay abreast of construction and insurance knowledge and stay up-to-date with certifications, classes, and trainings. Continuing education is a vital component to staying current with industry trends. An effective claims adjuster is a strong communicator. Clear and concise communication is essential when speaking with a variety of individuals. Communication refers not only to speaking but is closely related to listening. Listen to hear, rather than listening to respond. Strive to insert patience and professionalism into your communication style. Give attention and time to refining your people skills and customer service approach. As a claims adjuster, you become very familiar with multitasking. Being detail oriented is not a preferred quality but a required characteristic to be successful. A claims adjuster position is not a normal 9-to-5 job so it becomes crucial to self-motivate, self-manage and use every minute productively. Manage expectations, prioritize, and allocate time wisely as there are times that you are pulled in many different directions. Be accustomed to and comfortable with juggling multiple tasks at a time. Change is inevitable, in fact, a change in circumstance is how a claims adjuster continues to work. Keep a calendar and a detailed schedule but be flexible, as schedules can quickly change. Be able to adapt not only to a time change but a change in scenery or a change in personality and demeanor from one customer to the next. The ability to be adaptable doesn’t mean that you need to compromise ethical standards. Ethics plays a crucial role in a claim adjuster’s work. Avoid the temptation to practice unethically and always remain rooted in your ethical principles. Be careful when choosing which type of behavior to engage in and which tactics you employ on your day-to-day. The days of writing out claims adjustments by hand are over. The emergence of technology has made everything electronic. Not only do you need to be familiar with technology but proficient and quick. If you are not great with computers, consider taking a computer class to enhance your skills. Be aware of all apps and programs such as Xactimate, that helps to simplify or add convenience to a claim adjuster’s work. 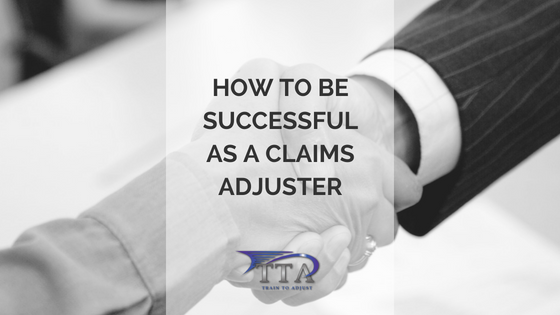 A successful claims adjuster always looks to improve their craft, whether that is implementing a new process or actively trying to be a better listener. Start with one idea, master it, and then move on to the next! There’s no limit to what you can accomplish and where you can go with your career.